The Belmore Frameless Hinged Shower Door provides universal sophistication and quality craftsmanship to your bathroom's decor. Available in a vast array of sizes, the Belmore is designed to meet the solution of uneven walls with its inline wall channel providing up to 1 in. out-of-plumb adjustment. The Belmore comes ready to install and will breathe new life into your existing bathroom's interior. Its StarCast by EnduroShield coated premium clear 3/8 in. tempered safety glass; tested and certified to ANSI Z97.1 Standard, hardware constructed of durable stainless steel and leak-seal edge strips make the Belmore a smart, stylish solution to your existing alcove. A perfect door with a perfect fit, only from Aston. Shower base not available. This GE 36" French Door 26.7 cu.ft refrigerator features bright crisp LED lighting throughout the fresh food and freezer compartments, TurboCool temperature management, and advanced water filtration. GE products offer the best in contemporary design matched with the latest in appliance technologies to transform the way you live. Sporting a bold, dramatic look and state of the art features, this collection provides the perfect combination of style and innovation throughout your kitchen. 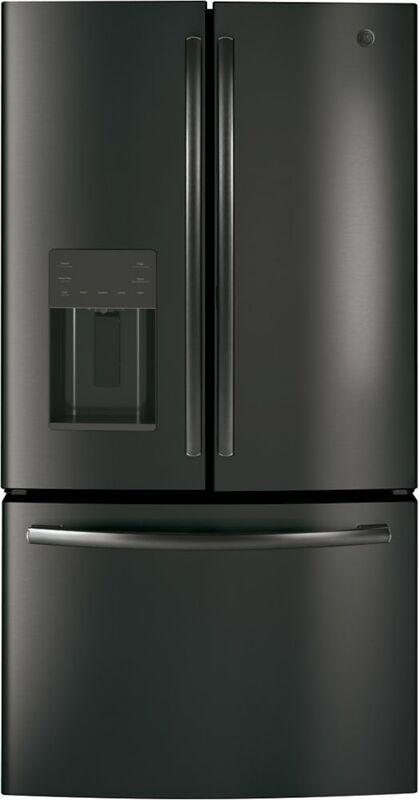 This GE Profile French door refrigerator features a built-in Keurig K-Cup Brewing System. Brew your favourite K-Cup coffee straight from you GE Cafe refrigerator with the Keurig brew system integrated into the external dispenser on the front of the refrigerator. The Precise Fill setting dispenses filtered water in accurate measurements for easy drink and food preparation. 36"" Bottom mount French door refrirator, 25.5 cu.ft - Black Stainless Steel - ENERGY STAR® is rated 4.4 out of 5 by 887. Rated 5 out of 5 by Gr82trvl from Love it I love the look of this refrigerator, it has very clean lines. I’m amazed at the amount of room. I filled it with everything from my old refrigerator and then put three dozen cupcakes on the shelf and still had room to spare. what is the annual energy consumption on this fridge?